Bird netting is one of the most popular, effective and long lasting methods for protecting buildings and other structures from birds. When installed correctly, it can provide a safe and discreet barrier to keep birds out. Bird nets can be installed around buildings, roofs, warehouses, industrial areas, fruit cages and around crops to protect the area from birds. It is important to select the right type of net depending on the intended use and the bird species which requires exclusion, as well as the correct fittings to ensure the nets provide adequate protection. Our High Density Polyethylene (HDPE) bird netting is ideal for protecting crops against many types of birds and rodents. 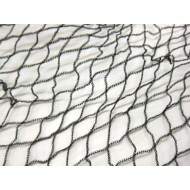 It is a lightweight net which is easy to install as a roof net over fruit cages or poultry installations. The nets are soft, strong, tangle free and are suitable to use with or without a frame. They are also UV stabilised and rot proof, which makes them suitable for outdoor use. The netting will not harm birds and the mesh will still allow bees to pollinate the fruit. The average lifespan of the net is 10 years with normal use. The net is available in a range of sizes with a 20mm diamond shaped mesh.